@cricklewood which release year was this bottle of Legacy? They do vary from year to year. Legacy from 2010 and probably 2011 and 2012 were fabulous. Later releases showed more anise flavour, which I do not like in whisky. Regardless, Wiser's Legacy is the best of what Canada has to offer. By 2013 there were a few bottles of Wiser's Legacy being sold in the US, although I bought all of my bottles in Canada. BTW if that Weller Antique and 12 yo were released almost anywhere in the US with prior public notice they would have been gone in an hour, and that only if you put limits on bottles per customer. I am so happy I came into this hobby when nobody liked whisk(e)y. I was able to buy a lot of great stuff for little money, because I was willing to like something contrary to the flow of public taste. @Victor sadly the bottle code is not very clear but I can tell by the label that it's from the final years of production post 2015. I know there was a bit of a shift in profile on this whisky over the years, perhaps it is in part due to change of production on the rye, which might make sense in relation to that anise/licorice note. Oh I know the Bourbon mania is real, it even extends to things like Blanton's which is apparently rare as hen's teeth in certain states it seems. A better example would be the arrival of JD barrel Proof at the SAQ, the first time I see it for sale in Canada I believe, or even the way things like Knob Creek Single Barrel sell here. If this isn't an indication that people are looking for and ready for full bodied, flavorful whiskys, I don't know what is. It's much like anything that runs counter to popular tastes that one days shifts, I am happy to see the things I love get the recognition they deserve even if it pains me that it means I may have a harder time indulging in the very things I loved. We know from having access to two vintages of cask strength Lot No 40 that batches will vary for any of a number of reasons, such as discontinuation of malted rye in the mash or simply the selection process for mature barrels. @paddockjudge by definition, WIser'e Legacy must be "Doctored"
@cricklewood "sleeping giant" is a curious title for a discontinued whisky. Not only has Wiser's Legacy slept, it has croaked, at least as far as most people in the world getting to try it is concerned. 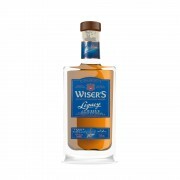 I have since April 2011 been a giant fan of Wiser's Legacy, at least of the 2010-2012 releases of it. This 2019 review is more like a post-mortem of a classic, sort of like saying, "Hey people of the world: go back to 2005 and buy 30 yo Ardbeg", or "Go back to 2009 and buy up Pappy Van Winkle." I am happy to be sitting on some bottles of Wiser's Legacy, and I wish that @RianC could taste them, because I like the early releases of Legacy much more than I like Lot 40, standard or 2017 CS. Tempus fugit. You snooze, you lose. There is no going back to the opportunities of yesteryear, and while there are plenty of tasty items out there, some of the very best stuff of a few years ago is very hard to experience without paying through the nose to get it. @Victor, the title is the one that I used for my blog post which was much longer. I edited the text here for the sake of brevity, it's a reference to the millions of barrels of whisky tucked away in the warehouses of ADL,Hiram Walker, Crown Royal and Black Velvet. All that potential is there sleeping, how some of the better barrels are being vatted away in all manner of tepid releases. It was also a way to highlight that a release of the caliber of the Northern Border collection did exist beforehand, it's not necessarily new, just unexplored. Yes reviewing a discontinued whisky is perhaps limited in its usefulness, yet I know many bottles of Legacy still exist in the wild. It's also possible for them to vat together this recipe again, yes there will be inconsistencies with batches but that's bound to happen, I just think we could use more of this kind of thing on the market. @cricklewood nicely explained. Thank you. One cannot have too much Wiser's Legacy. Reading that Wiser's Legacy is Don Livermore's own personal favourite increases my estimate of Dr. Livermore.